Professor Cowan was born in Cleland, Scotland. He earned a B.Sc. in Chemistry with first class honors from the University of Glasgow in 1983, and subsequently pursued graduate studies in Organic and Theoretical Chemistry at the University of Cambridge with Professors Sanders and Buckingham, respectively. Following a NATO postdoctoral appointment at the California Institute of Technology with Professor H. B. 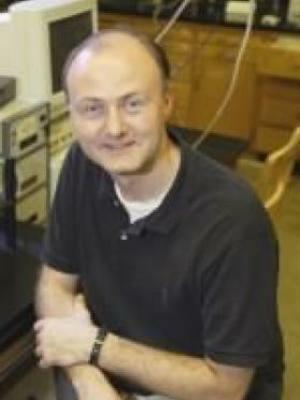 Gray, he joined the Ohio State Chemistry Department in 1988 and was promoted to Full Professor in 1996. He has been a visiting Professor at the University of Florence and Harvard University. His research has resulted in the publication of over 215 research papers, and several books and patents. Major areas of interest have included studies of the complex biological chemistry of alkali and alkaline earth metals in nucleic acid chemistry and enzymology; the cellular chemistry of iron and iron-cofactors, the biological redox chemistry of sulfur and nitrogen; and the design and development of catalytic metallodrugs. He has been the recipient of several awards and recognitions, including an NSF Presidential Young Investigator award, an Alfred P Sloan Fellowship, Dreyfus Teacher-Scholar award, the Baekeland Award and Medal of the North New Jersey Section of the ACS, the Akron Section Award of the ACS, and Columbus Section award of the ACS. His scholarship has also been recognized by receipt of the Ohio State University Distinguished Scholar Award, and by election as a Fellow of the AAAS, a Fellow of the American Chemical Society and a Fellow of the Royal Society of Chemistry. Most recently he was named recipient of the 2011 Royal Society of Chemistry Award in Bio-Inorganic Chemistry. Our research seeks to understand the critical roles of metal ions in biology with a focus on some of the most important problems in bioinorganic chemistry. Of particular interest is the chemistry of cellular iron and its cofactors, the biosynthesis and trafficking of iron cofactors, and the molecular understanding of mitochondrial disease states related to cellular iron chemistry. These studies have resulted in the elucidation of novel and important discoveries in protein dynamics, mechanisms of cofactor assembly, and iron regulation and trafficking. Another focus of our work lies in the design of novel catalytic metallodrugs. In particular we are targeting structured RNA molecules as well as novel protein targets from viral and bacterial pathogens, and rationally designing metal-ligand and metal-peptide complexes that specifically recognize and damage these targets. Developing knowledge of the structural basis of recognition and the reaction chemistry are important goals that underlie our understanding of catalytic metallodrugs. Of increasing interest to our laboratory are investigations of the roles of metal ions in neurochemistry and neurological disease. These problems are tackled by a multidisciplinary approach that uses a variety of chemical, physical, and biological techniques; including, fast kinetics, chemical synthesis, multinuclear and multidimensional NMR methods, optical spectroscopies, EPR and electrochemistry, calorimetry, protein biochemistry, molecular biology and genetics. "Iron-Sulfur Cluster Biosynthesis: Functional Characterization of the N- and C-Terminal Domains of Human NFU". Y. Liu, W. Qi, J. A. Cowan, Biochemistry, 973-980. 2010. "Iron-Sulfur Cluster Biosynthesis: Characterization of a Molten Globule Domain in Human NFU". Liu, Yushi; Cowan, J. A. Biochemistry (2010), 7512-7518. "A Structural and Functional Homolog Supports a General Role for Frataxin in Cellular Iron Chemistry". W. Qi, J. A. Cowan, Chem. Commun. 46, 719-721, 2010. "Backbone Assignments of an N-terminal Extension of Full-Length Human Frataxin". Kalyan C. Kondapalli, Krisztina Z. Bencze, Eric Dizin, James A. Cowan, Timothy L. Stemmler. Biomolecular NMR 4, 61-64, 2010. "Redox Chemistry of the Schizosaccharomyces pombe Ferredoxin Electron-Transfer Domain and Influence of Cys to Ser Substitutions". Wu, S-p., Bellei, M., Mansy, S. S., Battistuzzi, G., Sola, M., Cowan, J. A. J. Inorg. Biochem. 105, 806-811, 2011. "Structural, Mechanistic and Coordination Chemistry of Relevance to the Biosynthesis of Iron-Sulfur and Related Iron Cofactors". Qi, Wenbin, Cowan, J. A. Coord. Chem. Rev. 255, 688-699, 2011. "Mechanism of Glutaredoxin  ISU [2Fe-2S] Cluster Exchange". Qi, W. Cowan, J. A. Chem Commun. 47, 49894991, 2011. "Influence of charge and structure on the coordination chemistry of copper aminoglycosides". Patwardhan, Anjali; Cowan, J. A. Dalton Transactions 40, 1795-1801, 2011. "Targeted Cleavage of HIV RRE RNA by Rev-Coupled Transition Metal Chelates" J. C. Joyner, J, A. Cowan. J. Am. Chem. Soc. 2011, 133, 99129922.